The Lastolite Ezybox II Switch Large is a lightweight light-shaping tool that adds a flattering, low contrast quality of light to studio, battery-powered and shoe-mount flashes. The Switch neatly solves the problem of choosing between square and rectangular formats. With the Switch you have them both in one softbox. Measuring at the front diffuser you start with a 35 x 35" square - a good size for head and shoulder portraiture. A simple zipper narrows the Ezybox to 35 x 17" for use as an accent light or for reflective objects such as glassware. The Ezybox Switch has removable interior and exterior diffusers that can be used in any combination or not at all depending on your subject and desired effect. With both inner baffle and front diffuser in use there is a 2.0 stop reduction in output. Please note that the Ezybox requires separate purchase of a speed ring for use. Box Dimensions (LxWxH) 19.0 x 10.0 x 4.6"
Ezybox II Switch Large (35 x 17" / 35 x 35") is rated 5.0 out of 5 by 2. Rated 5 out of 5 by Stewart from Great Modifier Fast setup. You can pull the two diffusers out and get great specular light. As a strip light it excels. You can get adapters for speedlites and strobes. You'll need the Speedlight Bracket to be able to mount your hot-shoe flashes. The speedring on the back of the softbox does have a single coldshoe on it but has no means of mounting the softbox to a stand (mostly designed for use with larger flashes/monoblocks). The Speedlight Bracket clips onto the speedring and has space for two units (comes with a split sync lead too). 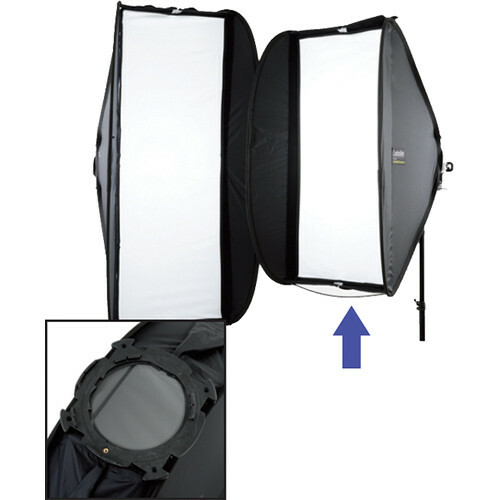 It also has a mounting point for using the softbox on a lightstand and lets you adjust the rotation of the softbox. Will this work with the bracket &amp; speedring from my ezybox hot shoe softbox kit 24 x24 ? The EzyBox Hostshoe bracket and speedring will NOT work with the EzyBox II product line. The opening at the rear of the EzyBox II products is much larger in order to accommodate two speed lights and a larger number of flash heads. The EzyBox II products include a Rear Support Ring for use with the optional Lastolite Ezybox II Speedlight Bracket B&amp;H # LASLBEZB2 MFR # LL LS2701 or 6 different optional speed rings.